For an operating systems that is multi-monitor capable for a very long time, Windows is surprisingly bad at herding its windows across larger and/or multiple screens. I had switched to the two display setup (again) this year and while Windows 7 has some new hotkeys they were completely lacking for portrait+landscape configuration. After some searching and comparing Winsplit Revolution came out on top as about easiest and robust utility to move and resize windows. In a nutshell app registers number of hotkeys for manipulating windows. The overly common issue of remembering shortcuts is solved very nicely here – numpad keys make a great and easy to follow mental model of how it works. Top corresponds to top of screen and so on. 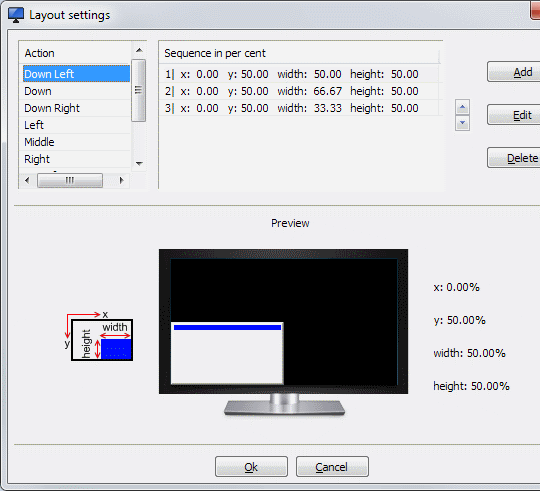 For each location there are couple of preset sizes, in percent of the screen taken vertically and horizontally. They can be freely modified and added/removed. App seems to rely on detecting which size window currently has to cycle through presets. With some custom configurations I tried it was loosing track (not recognizing current size of window) and going to start of the list, instead of next position. Some secondary hotkeys clashed with PhpStorm and took a while to figure out, since nothing was happening from invoking function like maximize vertically in already maximized window. It could use some way to indicate what is going on to help with things like that. Very solid freeware utility with complete out of the box functionality, but fully customizable as well. Portable version available. Is this compatible with Win 7? I had it and absolutely loved it a few years ago, when my primary machines were still XP, but now all my machines are on 7. Oops, got a little bit excited, and while skimming overlooked the part where you mention Windows 7. Heh. Looks stellar, thanks for the tip. I’m a big fan of dragging and maximizing in Win7, so much that I got the app to do on my Mac. Would love to be able to use more hotkeys too.